Wildfire Safety Bunkers now has an agent or installer near you. All components and specifications listed below have been rigorously tested and scrutinised by The Victorian Building Authority before product accreditation was granted to Wildfire Safety Bunkers Pty Ltd.
Our bunkers are constructed from a custom made concrete blend which is 100mm / 4" thick. This solidly reinforced concrete structure is not only incredibly strong at 65 mPa concrete strength - it is water and impact resistant. All components used on the door and its surrounds are made from high grade stainless steel. Every bunker door is fitted with an outside temperature gauge and the handle mechanism is designed in such a way that occupants inside the bunker can always release the door even if it has been padlocked from the outside. 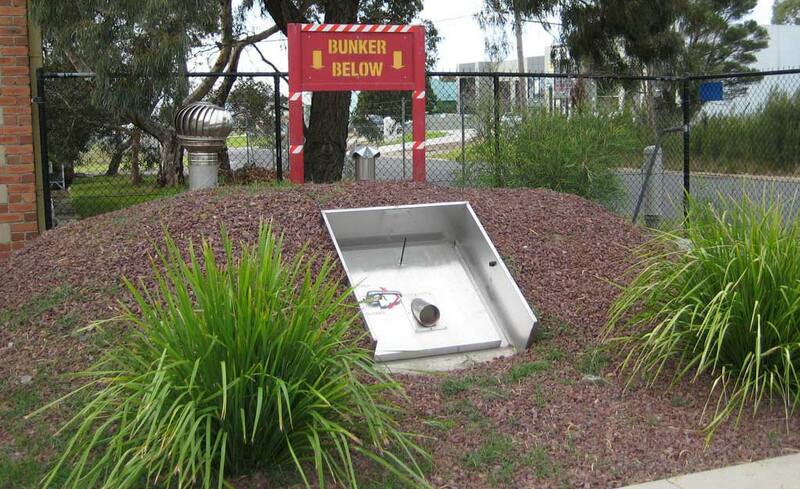 All bunkers are fitted with a high temperature viewing port for outside observations. Our bunkers are fitted with ventilation shafts that have shut off doors fitted inside the bunker. These doors are left open when not in use to stop the build-up of condensation and to allow fresh air in should someone find themselves unable to exit the bunker. All bunker locations and maintenance will be logged on Wildfires data base. Our bunkers are easily installed (4 hrs in clean soil) and can be removed and relocated elsewhere at a later date if required. All bunkers installed come with a comprehensive operations manual and the owners can be trained on the correct use of the bunker on site after installation is completed. All products are now bitumen coated for added water resistance. Our original and industry leading 6 person Personal Fire Safety Bunker. Accredited for use in Victoria by The Victorian Building Authority. Our accreditation Certificate stipulates that the bunker can be used on sites classified up to 'Bushfire Attack Level - Flame Zone (BAL-FZ), the highest bushfire risk level under the relevant Australian Standard. Subject to individual site assessment, the WSB is also approved for use in principle by the Building Rules Assessment Commission in South Australia. 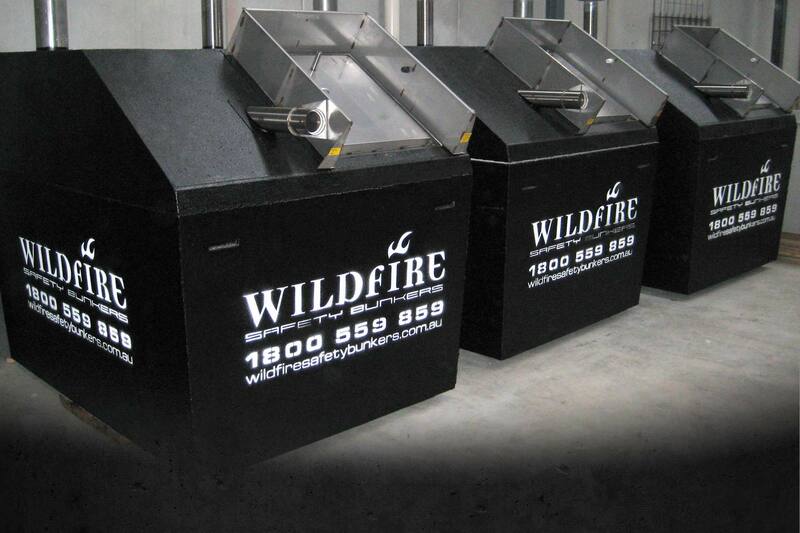 While there are currently no specific Government accreditation processes for Wildfire Safety Bunkers in other States and Territories or Federally, subject to obtaining local planning approval, the performance characteristics of the WSB mean it is suitable for use in all Australian State & Territories. We can advise you further on specific state regulations. Our 6 person bunkers external dimensions are – 2.0 m wide x 2.6 m long x 2.1 m high. They are delivered to site as a factory finished unit and simply craned into position or delivered in two halves and joined on site. PLUS DELIVERY + INSTALLATION + GST. 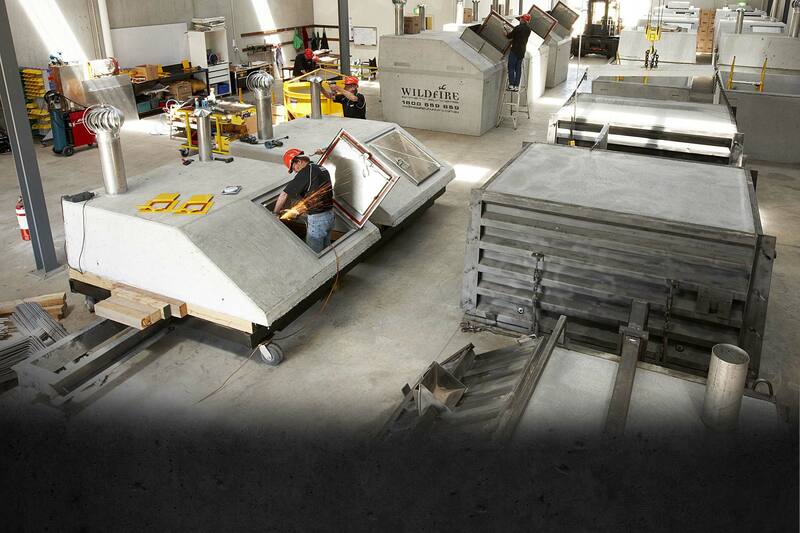 Our 12 person bunkers external dimensions are – 2.4 m wide x 4.2 m long x 2.4 m high. These units are delivered to site as three separate components and are joined on site by our qualified installers. Both units are passive air supply only and can give refuge for up to one (1) hour. Our Wildfire Safety Bunker construction is of Concrete and Stainless Steel to all exposed surfaces and a ventilation system ensures air circulation through the bunker when not in use – this is necessary to keep air moisture levels down in the bunker while not operating. It is essential to ensure that the ventilation system is closed when taking shelter in the event of a fire. Installation and transport are variable depending on location (Bunkers are delivered by Crane Truck where possible) and site conditions (e.g. : excavation in rock ?). 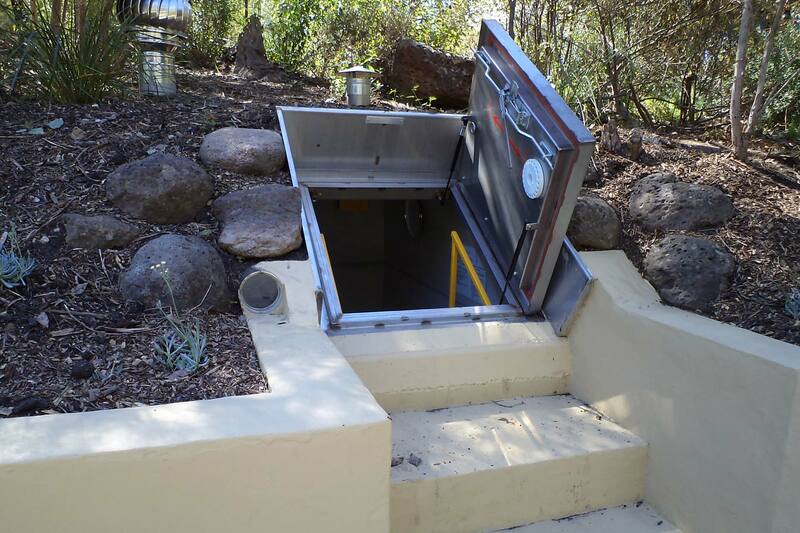 We will advise you on the appropriate site location and installation of our Fire Bunker. We can also advise you on Council Planning and State Building Code requirements to install one of our units on your site. Come and visit our 6 person display unit by appointment only 7 days a week.